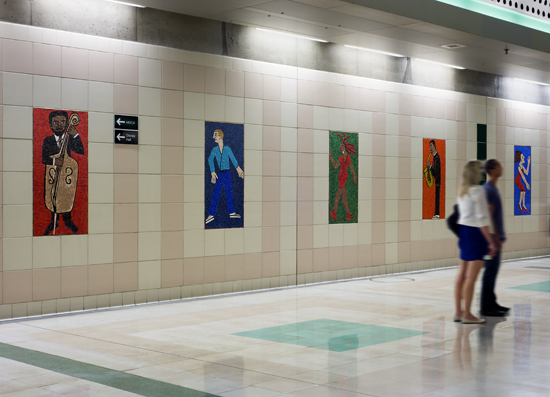 Ringgold designed 52 individual smalti (glass) mosaics at locations across four mezzanine walls. Each is a personification of creativity, performance, sports and fashion. Images include models walking the catwalk to boxers, baseball players and surfers frozen in the moment of their athletic skill, along with musicians playing and artists making their mark. 52 amateur and professional representations are illustrated in Ringgold's signature style of line drawing a simplified figure in a solid, color-block background. 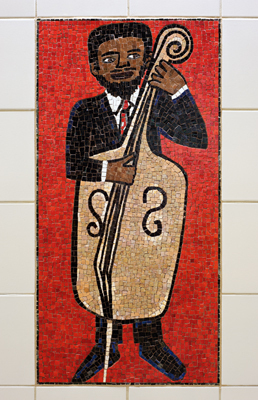 The glass mosaic panels were created by the artisans at Mosaika Art & Design studio in Montreal, Canada. "The content will reflect the creative energy of the Civic Center area. Thus it will be color studies of people engaged in creative activities such as: art making, music, dance, performance, fashion modeling, etc." 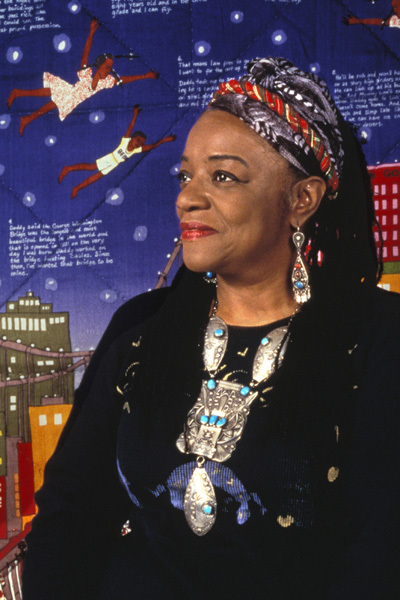 FAITH RINGGOLD received a B.S. in Fine Art and Education, an M.A. in Art from the City College of New York and 21 Honorary Doctor of Fine Arts Degrees from universities throughout the United States. She is a painter, writer, speaker, mixed media sculptor and performance artist. Faith is the recipient of more than 75 awards and has received fellowships and grants that include the National Endowment For the Arts Award for sculpture and for painting; The La Napoule Foundation Award for painting in France; The John Simon Guggenheim Memorial Foundation Fellowship for painting; The New York Foundation For the Arts Award for painting; The American Association of University Women for travel to Africa and The Creative Artists Public Service Award for painting. Her artwork has been exhibited in museums and galleries in the United States, Europe, Asia, South America, the Middle East, and Africa.